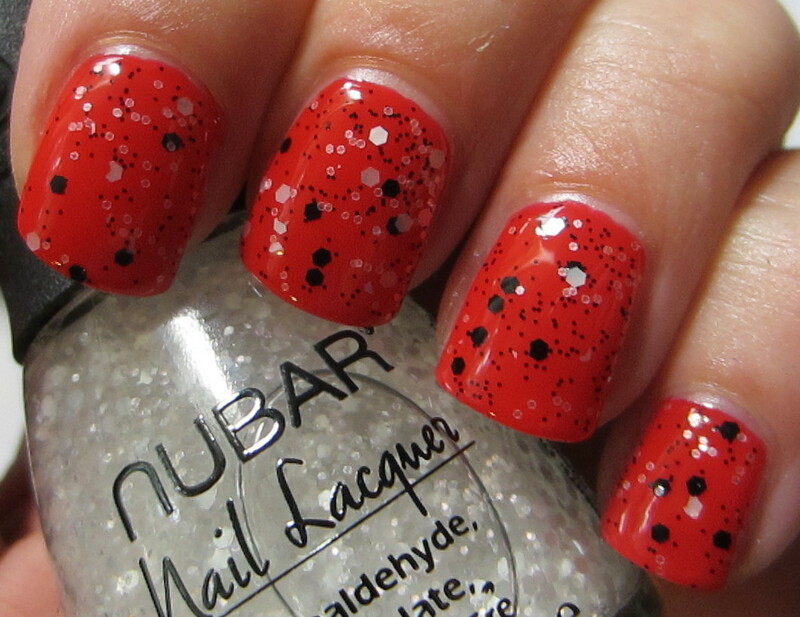 For some reason, I don't have a lot of Nubar polishes in my collection. So when I saw this cute little Polka Dots Collection, I knew it was time to expand my Nubars! There are two shades available, Black Polka Dot and White Polka Dot. These are designed as top coat polishes, and they both had a nice formula that wasn't nearly as jelly-like as many other glitter top coats. 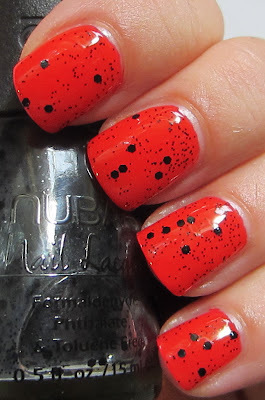 I used two coats on the Black Polka Dot, and one coat on the White Polka Dot. 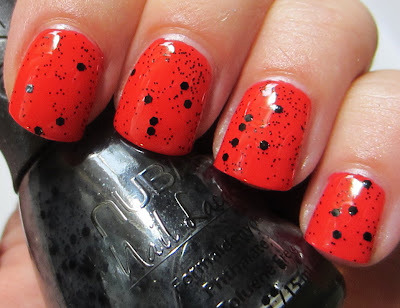 This is Black Polka Dot over Revlon's Devil's Candy. Devil's Candy is a fire engine red creme shade (with a fabulous formula!) from the Fall Masquerade Collection, which I bought purely for the name alone. Black Polka Dot has tiny black glitter mixed with black hex glitter. It looks like it has a soft black base, but it applies clear so it won't change your base color. Here's a look at both the Black and White Polka Dot layered together over Devil's Candy. I found that the Black Polka Dot gives a sparser coverage, particularly with the hex glitter. I ended up going with two coats of the black to get a few more hex pieces on the nail, but the White Polka Dot covers fine using just one coat. 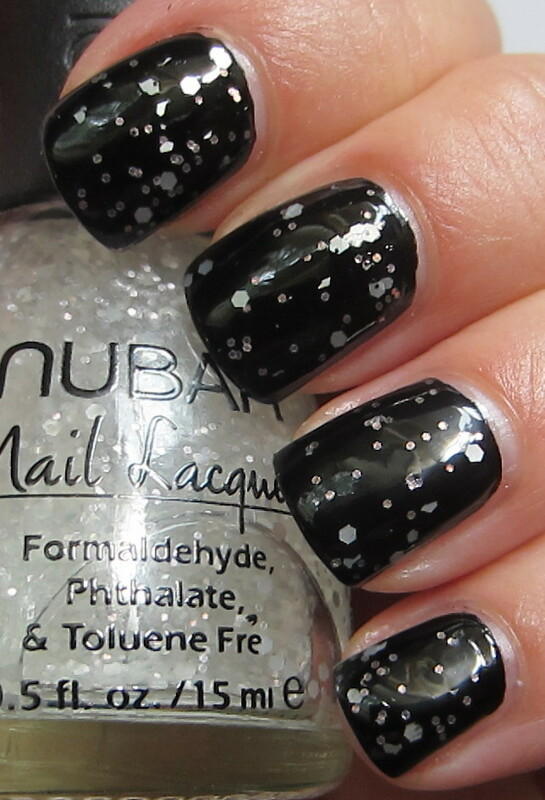 The White Polka Dot is shown over a black creme (Sinister Claw Polish), and these photos were taken indoors. The description of this said that it's fine holographic glitter and small white hex glitter in a clear base, but indoors, it was very difficult to detect any holo glitter action. It's very cloudy outside today, but I took the photos below outdoors to see if I could capture the subtle holographic glitter. It's more evident to me outdoors than my photos show, but it is fairly subtle. I saw pale coppery pink and aqua, and I do think that lighting definitely will play a part in just how much holo you see. 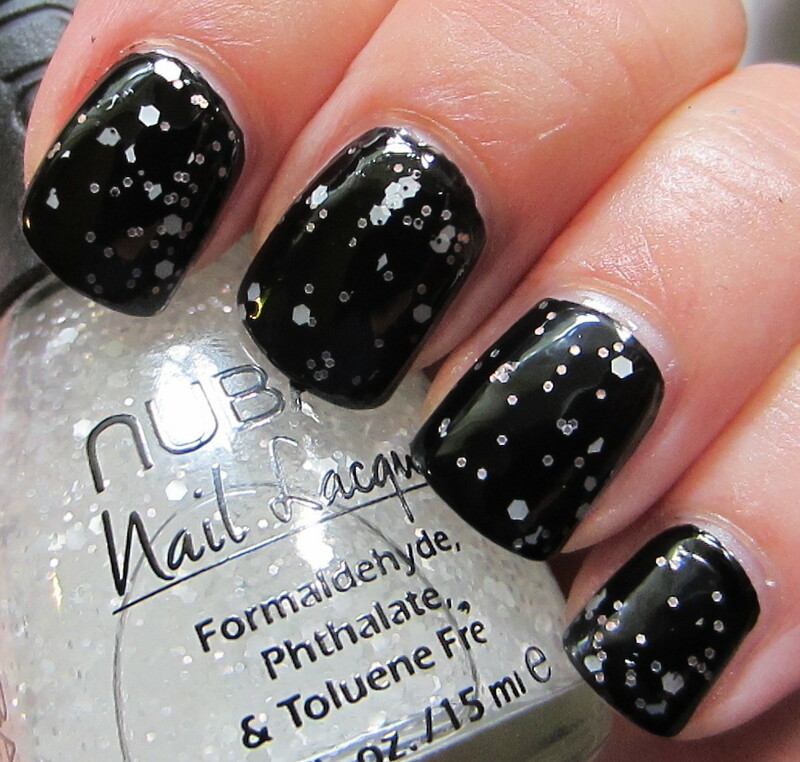 I like that it's subtle though, because I think the simplicity of the white dots on black is pretty on its own. These are cute and fun! You can build up the glitter with multiple coats, but I'm satisfied with the looks I got using two coats on the black, and one coat on the white. The coverage with the black particularly, is such that I ended up with less hex pieces, but these both have a more subtle look than what you normally think of when you think "glitter top coats", and I rather like that! The black gives a more random placement with the hex pieces, while the white seems to apply more evenly. I'm going to leave these out on my desk to experiment with them over other colors and see how they look. I love this white polka dot polish!! very nice pictures, btw!! The white polka dot over black is absolutely gorgeous! 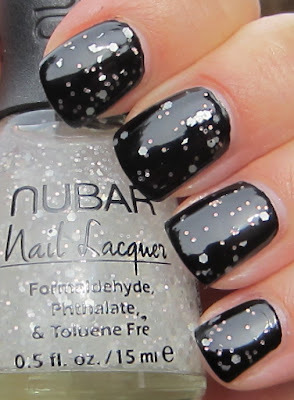 Ooooh, I like them both--are they forthcoming from Nubar, or where do I get my paws on these? I'm intrigued! I'm not sure if I like them or not, but they're definitely interesting! This is adorable! I hadn't heard of these. May order these. I love these glitters! The white looks great against the black!